Press release from McGill University of our research published yesterday in Nature Geoscience. Water scarcity is not a problem just for the developing world. In California, legislators are currently proposing a $7.5 billion emergency water plan to their voters; and U.S. federal officials last year warned residents of Arizona and Nevada that they could face cuts in Colorado River water deliveries in 2016. The researchers separate six key strategy areas for reducing water stress into “hard path” measures, involving building more reservoirs and increasing desalination efforts of sea water, and “soft path” measures that focus on reducing water demand rather than increasing water supply thanks to community-scale efforts and decision-making, combining efficient technology and environmental protection. The researchers believe that while there are some economic, cultural and social factors that may make certain of the “soft path” measures such as population control difficult, the “soft path” measures offer the more realistic path forward in terms of reducing water stress. 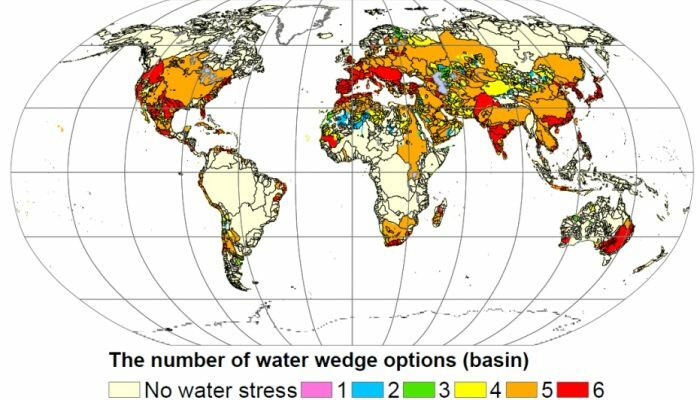 Agricultural water productivity could be improved in stressed basins where agriculture is commonly irrigated. Reducing the fraction of water-stressed population by 2% by the year 2050 could be achieved with the help of new cultivars, or higher efficiency of nutrients application. Concerns include the impacts of genetic modification and eutrophication. Irrigation efficiency could also be improved in irrigated agricultural basins. A switch from flood irrigation to sprinklers or drips could help achieve this goal, but capital costs are significant and soil salinization could ensue. Improvements in domestic and industrial water use could be achieved in water stressed areas through significant domestic or industrial water use reduction, for example, by reducing leakage in the water infrastructure and improving water-recycling facilities. Limiting the rate of population growth could help in all water-stressed areas, but a full water-stress relief would require keeping the population in 2050 below 8.5 billion, for example, through help with family planning and tax incentives. However, this could be difficult to achieve, given current trends. Increasing water storage in reservoirs could, in principle, help in all stressed basins with reservoirs. Such a strategy would require an additional 600 km3 of reservoir capacity, for example, by making existing reservoirs larger, reducing sedimentation or building new ones. This strategy would imply significant capital investment, and could have negative ecological and social impacts. Desalination of seawater could be ramped up in coastal water-stressed basins, by increasing either the number or capacity of desalination plants. A 50-fold increase would be required to make an important difference, which would imply significant capital and energy costs, and it would generate waste water that would need to be disposed of safely.